Amazing Male Nurses tend to be cat people...or I just have too small a pool to actually get good numbers. Boss man is crazier about cats than I am. Love the pictures of everyone's kitties! Enjoy this video of a blind dog playing catch. He was born blind and because of a kind owner can enjoy life. Latte is very nice looking. Louie and Mini in their usual spots. Murray in a close up. Nice pix Alix. I really like those silhouettes. Nifty idea or torture device? You be the judge. Sophie has a sore spot in her armpit (no idea how she go it.) So here is a nifty device from chewing on it. It's inflatable and attaches to their collar. She is not able to get to her wound no matter which way she turns. She can't quite figure out what is wrong. She just keeps turning in circles. 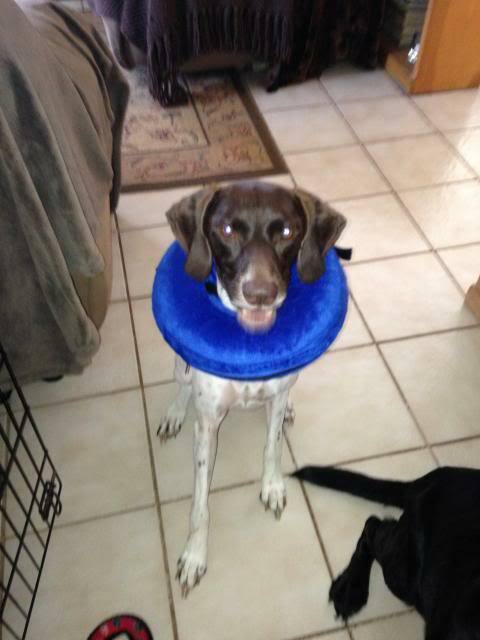 I think it is much better than the cone of shame for sure, though I don't think the inflatable donut would work for spaying/neutering or leg injuries. Yes. It depends on where the injury is. But it's working for the armpit sore. We have the large, plastic cone of shame as well.